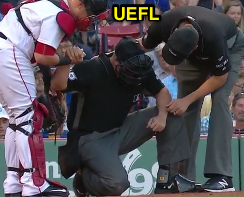 Josh Donaldson lost control of his bat, its flying barrel hitting the top of HP Umpire Chris Segal's mask/head. Christian Vazquez & Jordan Baker assist Segal. With one out and one on in the top of the 1st inning, Donaldson fouled off a pitch, losing his grip on the back during his swing, sending the whole (not broken) bat careening backwards and toward the left side of Segal's face. Replays indicate the bat struck the top portion of Segal's facemask, but did not appear to hit Segal's unprotected jaw/temple/ear. Segal remained in the game in the immediate aftermath of the play.